I have had quite a bit of highs and lows this week! Just when it seems all is right with the world....BAM!!! My oldest daughter turned 23 yesterday!! I can't believe she is that old.....that I am that old!!!!! Where has the time gone? And she is expecting her third child, my third grandchild in November?? Geez, get the oxygen and the walker ready for me!!!! She lives in Tennessee and was going to come to Florida to spend her birthday. What a great thing! I was so excited. Then at the end of last week she called me...Mom, a shelf fell over on Logan (youngest grandson) and they are rushing him to the ER. I can't even tell you the emotions that flooded me! Fear...is he going to be ok?, empathy...my poor little girl going through this, guilt....I am not there!! After a few grueling hours of sitting, waiting, and praying I get the next call. He has fractures in his face and skull and they are air lifting him to Vanderbilt in Nashville. The worse parts after this were the pictures!!! This is the picture we received after he was air lifted and admitted to Vanderbilt. 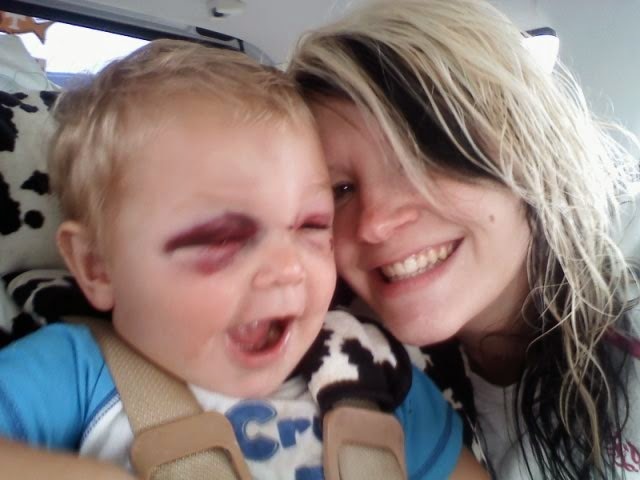 This picture came with the news that there were two fractures to his face one to his skull, and he may need surgery. My heart sank and I was so upset!! Everyone posted for prayer and with in an hour there were prayers coming in from all over the nation and some from out of the states! It is very nice to know that there are that many praying people!!! He was sitting up, fully coherent, and was talkative! He was telling the doctors Thank you when they came in and was his happy self!! Prayer changes things!! Over night!!! By that afternoon they had removed the neck brace and his daddy finally got to hold him!!! Look at how much peace is in that babies face!!! Yea dad looks like he needs some sleep and I am sure by that time he did!! Wow God sure is powerful!! It says "We are going home!!!" Such a miracle. Over the next few days my daughter would text me telling me that his eye was opening more and more everyday and that he was doing well. Then yesterday I got the best picture yet!!! Although he still has a bit of the Rocky Balboa look to him he is amazingly better! He is truly in God's hands and a walking miracle and testament to God's healing powers!! Less than a week later and he is doing great!! Thanks to all who prayed and asked about him!!! Thanks Tom (big papa) You and grammy have been marvelous too. Rhonda and I have grown to love you guys too. We love Kim and the amazing grandchildren she has given us. She is truly a huge part of our lives and we are so glad she is part of our family.